After a teaser just a few days back, the fifth generation Nissan Micra has been unveiled at the Paris Motor Show. Staying true to the Sway concept revealed last year, the new Micra is now bigger and better. The car is more premium than the model it replaces. It will go sale in the European market from March 2017. The new version is nothing like the previous generation Micra. It is also built on newer underpinnings, according to the Japanese manufacturer, which gives it a better handling characteristic. 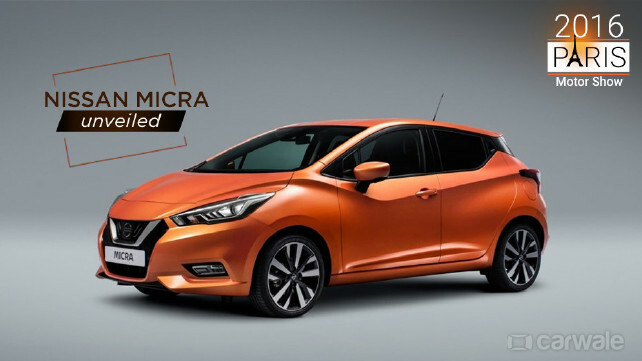 Sporting the V-motion grille which is a design element for the new-generation Nissan cars, the Micra is now edgier and sports 16-inches wheels as standard. The C-pillar gives an illusion of a floating roof, which also incorporates the rear-door handle lending the car a two-door appearance. The car will be powered by a choice of a 900cc 3 pot turbocharged petrol or a 1.5-litre turbo diesel, both producing 89bhp, which is mated to a five-speed manual or a likely optional CVT automatic. A 72bhp 1.0-litre naturally aspirated petrol engine may follow later. The car also features many safety aids such as Lane Departure Prevention, Intelligent Emergency Braking with pedestrian recognition, Intelligent around View Monitor, Traffic Sign Recognition, High Beam Assist and blind spot warning with a 360degree camera. They are all an integral part of Nissan Intelligent Mobility. The interior is now so much more upmarket, which seemed to be borrowed from costlier Nissans. A seven-inch touchscreen infotainment system with a Bose speaker system, a satellite navigation, mobile phone integration and Siri voice control via Apple CarPlay are part of the package. A brand new flat-bottom steering wheel looks sporty. When the new Micra takes the road next year, it will have to face bigger rivals now like the Volkswagen Polo, Skoda Fabia, Suzuki Baleno, and Ford Fiesta. As a part of the Renault-Nissan alliance, the car will be manufactured in their facility in France. Indian arrival of the Micra is still uncertain.